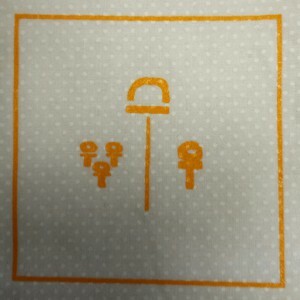 Home / BLOG / Open Building versus Architecture or Open Building as Architecture? 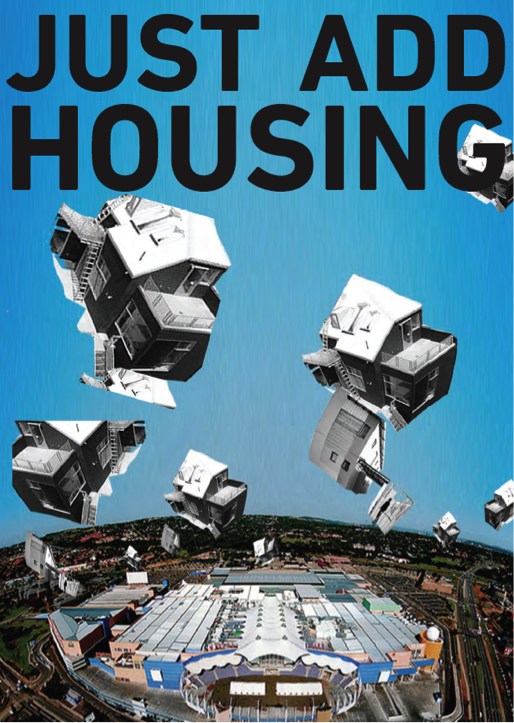 This brief text aims to define the term OPEN BUILDING in terms of its origins, history, etymology, context and connotations – with reference to its relevance to South Africa in terms of thinking and practice in architecture specifically, and the built environment in general. Is Open Building in opposition to architecture or an alternative way of “making” architecture or a transition from “old” ways of conceptualising and realising the built form to “new” way of doing so? Or perhaps it is a return to “old” ways of “doing” that were lost it the massive industrial developments of the 19th Century and rapid globalisation trends? After all, Habraken did declare that modernism was a regressive movement as it failed to acknowledge the complexity evident in older contexts in terms of multiple decision-makers and articulation of the different levels of the built environment (John Habraken in “10th International Conference ‘Open Building and Sustainable Environment,’” 2004). 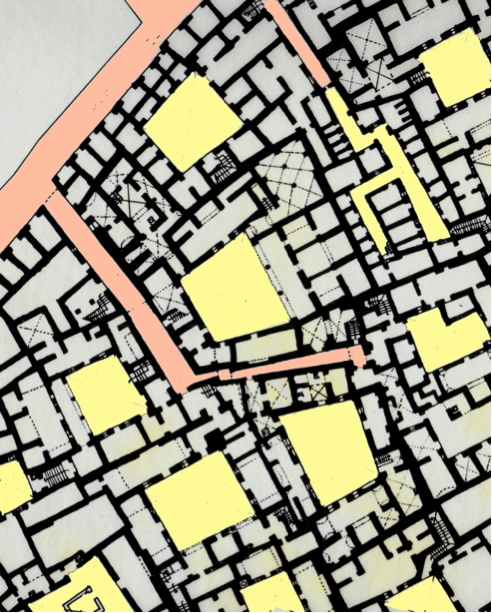 Habraken further illustrates this concept through the study of historical cities in his book, the Structure of the Ordinary”, using examples such as the Tunis Medina (below) to demonstrate how cities have develped as a “fine-grained living fabric” with no single party controlling the “whole” and where control is “heirarchically structured”. Kendall, links the increased “entanglement” in buildings to the gradual introduction of technical systems – with the era between 1900 and after the 1950’s being labelled as the “era of entanglement” and a future condition after the 2000’s being presented as the “era of Open Building” due to the search for “disentanglement” in the built environment. 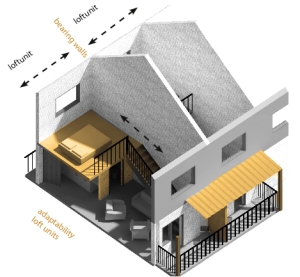 Open Building therefore also has different interpretations across the different levels of the built environment. 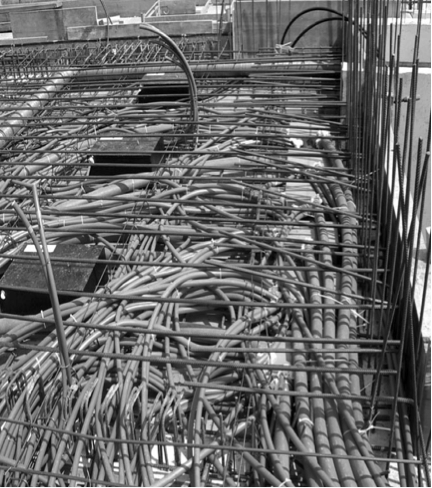 It can imply the way a building is “put together”, how buildings are assembled in terms of long- and short-life components and how the interface between building components allows for disassembly, replacement and upgrading with no disruptions to other building systems or components (see building entanglement expressed in the below image on the left from Geiser). 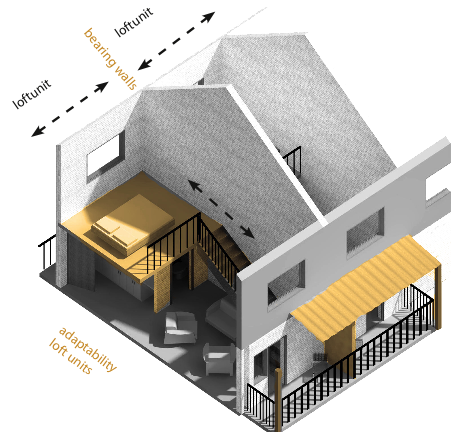 Yet, Open Building also implies the interface between building level and urban design level and between spaces within and outside of buildings and how people manage their relationships within the built environment through negotiation, transaction and deal-making (see the below image on the right by Cennette Swart, UP student 2007). 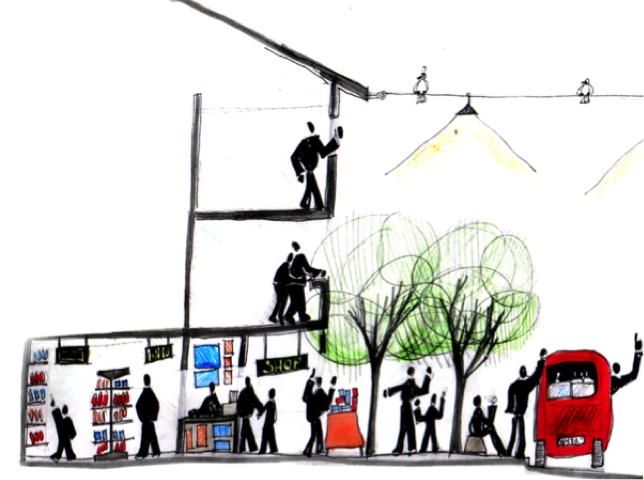 Habraken’s iconic image below illustrates the thinking behind Open Building – it explains the relationship between the individual and the collective and how to achieve a state of balance between the two through the interface of building and technology (http://uj-unit2.co.za/proin-vel-mauris-diam/). If one breaks down the term Open Building, it may allow for an understanding of why it was used to describe this way of thinking about the built environment. “Open” can mean [freely] accessible, uncluttered, approachable, receptive (amenable, hospitable, responsive), undeveloped, unbuilt, honest, begin… perhaps the term “receptive” and its definitions best explains why some Open Building thinkers refer to Open Buildings as being “lovable” as they have resonance with many users over time, an expression used by Frank Bijdendijk, Dutch developer of THE SOLIDS projects, who says that he wants his architects to design buildings which are “energy effective and adaptable”. “Time” is an important aspect of the concept of Open Building. 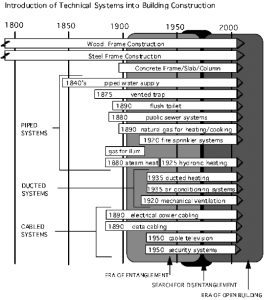 “Building” may be defined as structure, construction or edifice; it can imply the act of building or the product of a building process. 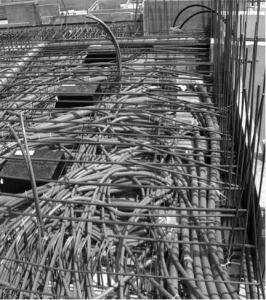 Open Building has been used both as a noun and a verb to express a thinking and practice as well as the products thereof within the context of the built environment professions in general and architecture specifically. 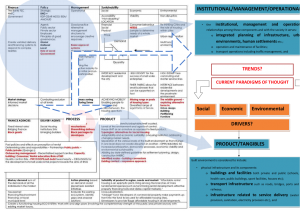 Open Building has socio-political, technical, financial and management implications at many levels of the built environment. 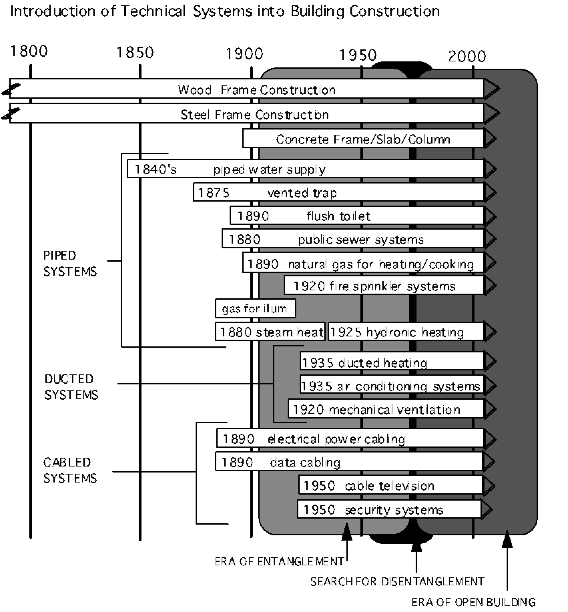 It also relates to many concepts such as “time-based design”, the 4th dimension of design”, “systems seperation”, etc. Open Building is also highly relevant to South Africa – and South Africa can be the pioneer for Open Building and innovative approaches to human settlements in developing countries and beyond. As we have seen from the above, Open Building allows for diverse interpretations of concepts that are not confined to any particular building type or product.” (http://uj-unit2.co.za/proin-vel-mauris-diam/) However, as far as the author can tell, the term Open Building is not used in South Africa except through the academic programmes and through her work at the CSIR during the period 2010-2012). 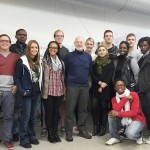 The author established the Housing and Urban Environments (HUE) research field at the University of Pretoria in 2007 (to add website link) and UJ’s research and academic UNIT 2 “Architecture and Agency: DESIGN | MAKE | TRANSFORM” in 2015 (www.uj-unit2.co.za) – both focused solely on promoting the concepts of Open Building in South Africa. This of course does not mean that there are no references to concepts of flexibility, adaptability and change in the built environment – this can be found in policy, academia and practice. However, the author does argue that there is no complete and comprehensive understanding of the concepts of Open Building (under any other name) being presented anywhere else. 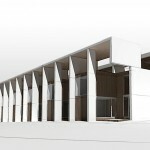 The concept was used as the theoretical underpinning for the development of the TSELA TSHWEU DESIGN TEAM (TTDT) vision for Sustainable Humane Settlements for South Africa as a response to President Zuma’s State of the Nation Address in 2010 calling for faster, harder and smarter government action in respect of service delivery and the achievement of a developmental state. (While a whole team and different agencies were represented, it would be important here to mention SHiFT and Diana Arivanitakis in name due to the key role she played in the process). The vision aims to achieve vibrant, attractive, integrated, natural, environments in which the pedestrian is the priority, and where the built environment embraces and encourages the spirit of Ubuntu thereby providing dignified settlements. The Tsela Tshweu Design Team vision encapsulates ten key principles which are applicable to green fields projects as well as existing townships, informal areas and wealthy suburbs. They are based on the idea that value needs to be added to what is already there and to retain what works. The vision also addresses the whole housing “eco-system” reinforcing the idea that there can be no solution to low-cost housing if it is not acknowledged that it is integral to the city – and thus the debate on low-cost housing should be integral to any debate about the city as a whole, including the wealthy suburbs. 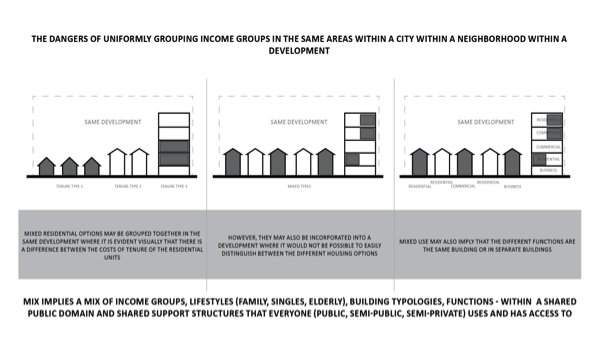 The aim is towards achieving mixed residential environments in terms of tenure, typology, income groups, functions and densities. It is believed that this would generate vibrant, attractive, integrated environments in which the pedestrian is the priority. 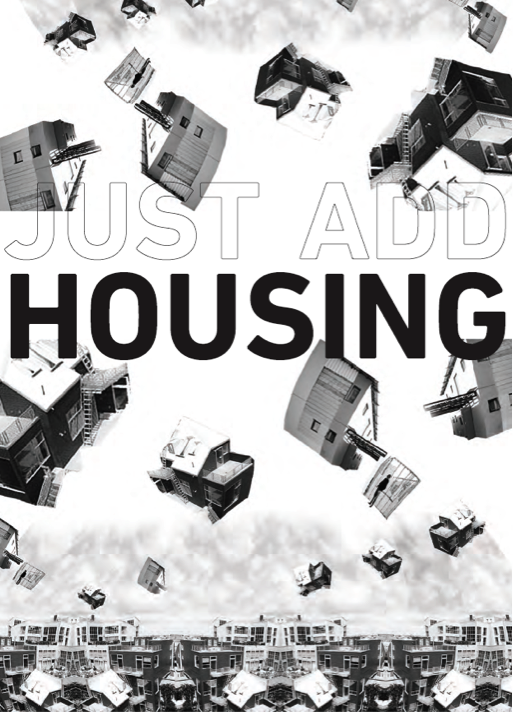 (http://uj-unit2.co.za/architecture-and-agency/tsela-tshweu-design-team-ttdt/) (The images below, by Calayde Davey, illustrate one of the TTDT principles of adding a residential component to all developments in cities ensuring a mix of functions and better integration in cities). The Built Environment should function as a total ecosystem. South Africa is a divided nation with divided cities as a result of its political history. 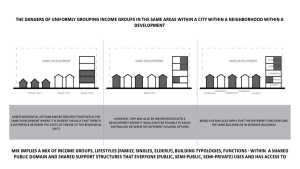 The author has used the concepts of Open Building as offering the tools to, not only promote the idea of complete, integrated, sustainable, human(e) settlements and multi-layered environments, but also to realise them through alternative mechanisms of delivery, finance and design that acknowledge built environment levels and diverse agents of decision-making. 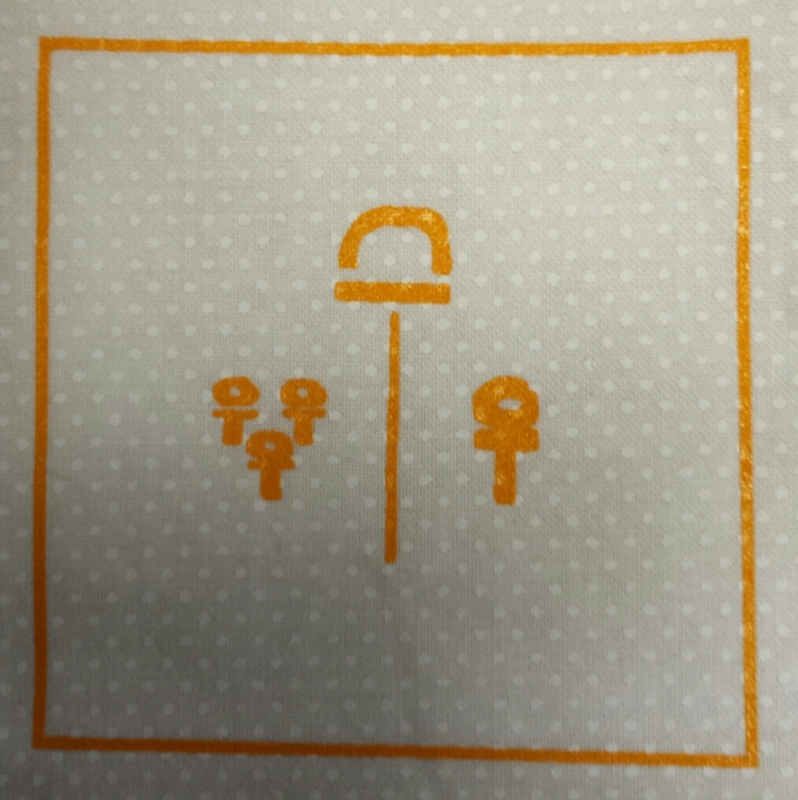 The production of space and the built environment is understood as a social construct and people and society are an important consideration in an understanding of the built environment where built form and space are seen to help manage social structures and relationships to the benefit of all. 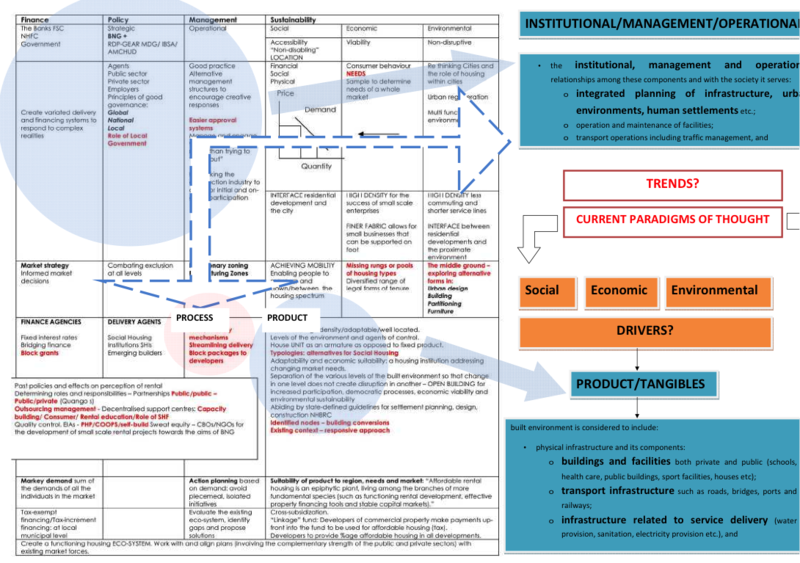 The below diagram aims to present the built environment eco-system in South Africa to demonstrate the complexity of the system. 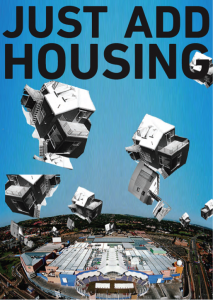 Understanding built environment levels and diverse agents of decision making is key to being able to understand how to harness Open Building as a tool towards transforming space and production systems in South Africa. The below diagrams (by Jhono Bennett) simply express how changing funding systems may have profound impact on the products delivered and benefits to people across the economic spectrum. Again, these principles may be applied at neighbourhood and city scale, or at building scale. This is demonstrated in the below images by Jhono Bennet and Calayde Davey. So in conclusion, is Open Building an alternative to architecture or just a different way to practice architecture? I believe that, like passive design, economic design, good design, Open Building should be the way in which we practice architecture. 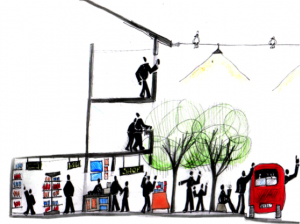 Open Building is linked to concepts of sustainability, participation and inclusivity. It should not remain as a niche area in the field with a few proponents internationally – and hardly any nationally – but should rather become the way that we teach and practice in the field. Open Building is, therefore, architecture… but architecture has lost its way.